Alona Rodeh is a visual artist based in Berlin and Tel Aviv. Represented by Christine König Galerie, Vienna and Rosenfeld Gallery, Tel Aviv. Feature on Frieze Magazine by Hili Perlson! DARK AGES 2020, Solo show, Salzburger Kunstverein coming up real soon! Blind Date: Tuesday May 29 at 8:00 pm: screening of Barking Dogs Don't Bite and To The Moon and Back at the Alaska Experience Theater, a joint project of IGCA (International Gallery of Contemporary Art, Alaska) and Bivy, both in Anchorage. Announced! 19-22 April: New Positions solo booth Art Cologne with Christine König Galerie! 10th of March at 19:00: Body Talk: group show at Circle1 - Platform for Art & Culture, Berlin. FB event. Safe and Sound Deluxe Edition on Printed Matter! 28-29th of December in Tel Aviv: as a part of בטון חצוף, screening of To the Moon and Back, and a new public artwork for the Tel Aviv Fire Brigade. FB event (Hebrew only), and a website! 23rd of August: Jerusalem Season of Culture: Above and Beyond, rooftops of jerusalem, showing a work from way back 2008. Old and new works: solo booth at MiArt Milan with Grimmuseum, Berlin: 31 March - 2 April. Preview of the works can be seen on artsy. New works at Fresh Paint Art Fair, Rosenfeld Gallery booth, Tel Aviv 28.3.17 - 01.4.17. Preview of the works can be viewed on Artsy. Also, a recommendation on Ha'aretz (Heb). New work for the opening of Würfel TLV by Neumeister Bar-Am, Berlin based Gallery: 23th of March at 20:00, Beit Romano Tel Aviv. Group show Elastic Collisions at Kunsthalle Exnergasse: Wednesday 16th of March. FB event. 23-25th of December, Dizengoff Square, Tel Aviv: a temporary public commission by the Tel Aviv municipality, in collaboration with the street marking department of the municipality, initiated by the White City Center. Curated by Hila Cohen Schneiderman and Tom Darom. 26.11 14:00-20:00: Openhaus ZK/U, including round table of the Dis-Placement artists. Bpigs interview Enrico Centonze on the Grimmuseum booth at abc art berlin contemporary. 15th-18th of September: Art Berlin Contemporary, presenting a new series of graphic works with Grimmuseum, a new outdoor textile piece, a lecture and a special tour at a Berliner Feuerwehr station. Here is a little interview with some insights. 15-18 of September: Peninsula: Group show, Tel Aviv annual season opening 3 day show, curated by Roni Hajaj. 16th of June at Cinematheque Tel Aviv: Premiere of In Dreams, a new video piece produced in collaboration with the Tel Aviv University Film Department. 6-7 of June: Learning Songs, Premiere at Israel Festival: A new piece by Nava Frenkel. Stage, costumes and general design by Alona Rodeh. The Safe and Sound Deluxe Edition on Rachel Kinrot's website. The Contemporary Art Museum St. Louis’s 2016 Auction includes The Glowing Battenberg Cake, from the Safe and Sound Poster Series. Où est le cool? ‪‎LesInrockuptibles‬. 6th of February at HKW, Transmediale: Translating the Hyper-visible and the Invisible. Panel discussion moderated by Teresa Dillon, Carsten Stabenow. With: Víctor Mazón Gardoqui, Alona Rodeh, Daniela Silvestrin, Mario de Vega. Tuesday the 29th of Sept at 19:00: Urban Knights, hosted by Teresa Dillon. Alona will be talking about "Safe and Sound Deluxe Edition", the artist publication. RSVP via FB. September 18-20: Safe and Sound Deluxe Edition + Limited Edition of Reflective Drawstring Bags at the NY Art Book Fair / Printed Matter, Moma PS1! Upcoming Artist Publication pre-order now on THE GREEN BOX Kunst Editionen Website. Also on Amazon! The Empire Strikes Back: Kingdom of the Synthetic: Ariel Efraim Ashbel's new piece, Alona Rodeh was head of the design of this spectacular piece. FB event, Tickets at HAU. Save the date! 2nd of July, new works at "The Crystal Palace and the Temple of Doom" at Petach Tikva Museum of Art. 21st of May at 17:00: "Barking Dogs Don’t Bite" at the Athens Digital Art Festival, as a part of the video selection "Implicit Spactatorship", curated by Pavlina Mladenova. 14th of May at 20:00: Artist Talk at Scope Session #43, Panke. Details here. KIK! one night show at Kino International, DISPLACEMENT. Curated by Amir Fattal and Viktor Neumann, Friday 27th of February at 21:00. Presenting new lightboxes from the ongoing series 'Safe and Sound". 27th of December at 12:00: Artist talk at Herzliya Museum, details here. 18-20 of December: Supporting Anarchists Against the Wall by buying art, incomes to the organisation. Minshar Gallery, Tel Aviv. Group show at Lady Fitness, Berlin -Thursday the 16th of October. Review "Back to Berlin" at Herzliya Museum, Globes, Heb. 6th of June 19:00-22:00: Open Studios at Künstlerhaus Bethanien. Bpigs say: "Alona Rodeh's neon bathed studio wins all the cool points"! April 4th at 19:00: Private view of ESTATE, group show at NEO Bankside, London. Curated by Carmen Stolfi, in collaboration with Art:I:Curate. FB event. Above and Beyond catalogue is distributed online - Sternthal Books! Thursday the 12th of December at 18:00: Barking Dogs Don't Bite at Galeria SalonAkademii, Warsaw. Curator: Jacek Sosnowski. FB event. Celeste Prize 2013 finalist. Curator and judge: Ami Barak. Exhibition opens in Rome, December 7th, invitation here, FB here. Artsetters are kicking off with an amazing website. 2 works up for sale. Also available via Oh-So-Arty. October 5th: Screening of 'Barking Dogs Don't Bite' at Neues Kino, Basel, via Ma'amuta. 18th of September at 19:00: Open studio at Künstlerhaus Bethanien, Berlin. Critic's Picks on Artforum: Rotem Rozental on "Showtime"
30th of August at 11:00: Gallery talk in "Showtime" with Hadas Maor, Naama Tzabar and myself. Helena Rubinstein Pavilion, TA Museum, free entrance. 29th of August at 20:00: "Culture on the Bar", a collaboration of TimeOut Tel Aviv and the Israel Lottery Council for Culture and Arts. I will talk about the roots of cinema and the decline of theater. FB event here. 3rd-17th of August: I'm leaving Tel Aviv for a one year residency at Kunstlerhaus Bethanien, Berlin. Sale is At Z I Z Artspace. 1st of August at 20:00: A large-scale commission at Helena Rubsinstein Pavilion, Tel Aviv Museum, in Showtime, curated by Hadas Maor. The FB event is here. The exhibition has it's own website! August 25th at 20:00 at Hezi Cohen Gallery: a duo show with german artist Florian Neufeldt. Matched by Katharina Schendl from MAKE.A.MATCH. 'Barking Dogs Don't Bite' won 2nd prize for Israeli Experimental Film and Video Art, Jerusalem Film Festival. 'Above and Beyond' exhibition is extended till the 25th of July, and catalogue is finally in print, available at CCA Tel Aviv. Designed by Nadav Shalev, with texts by Chen Tamir and Roy Brand. Photos by Elad Sarig. Conversation with Roy Brand is also online (Heb.) on Erev Rav. 'Dynamite!' Limited Edition in 3 colors, exclusive on Oh-So-Arty. Sarah Peguine from Oh-So-Arty recommends the show at CCA and visited the studio. 8.6.13 at noon: gallery talk and lecture at the exhibition now on show at CCA. I will discuss the ambivalent relations of Art and Entertainment. Featured in Border Crossings Magazine: now the full interview is on Artis's website. December 13 at 20:00: Issue 124 launch, Border Crossings Magazine. 'Fire, Work!' a 5 channel video piece will be screened. An in-depth interview and portfolio are featured in this issue. Parallel to Rockefeller, Black Box: a billboard project in the streets of Jeruslem, with a printed image of 'If I'm a prince and you're a prince'. October 22nd at 12:00: Lecture at the Faculty of Architecture, University of Manitoba. Same evening: 'Barking Dogs Don't Bite' at Arch 2, the faculty gallery. Parallel: offsite project in collaboration with Plug In ICA and Faculty of Architecture. September 6th at 20:00: 'Barking Dogs Don't Bite', a new video piece in group show 'Province: Visitor Center', curated by Leah Abir. Commissioned by the Arts Department of Tel Aviv Municipality. 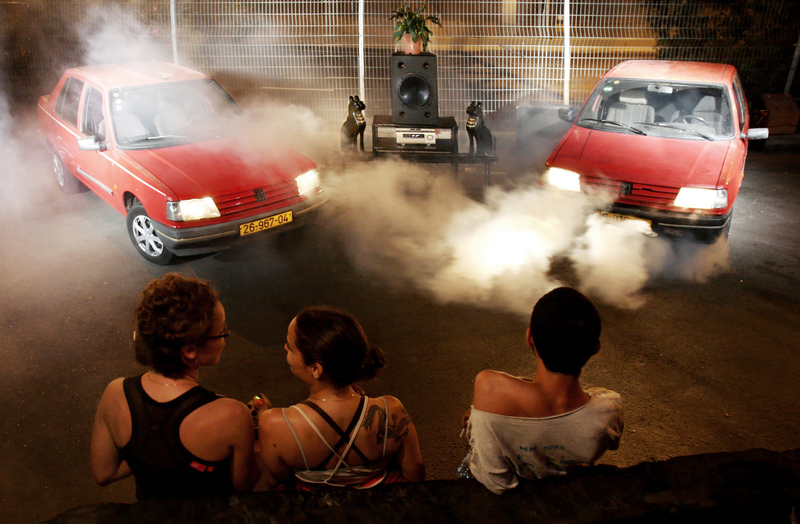 Collaboration with musician Rona Geffen; 2 Peugeot 309, 2 smoke machines, 2 cat-figured sculptures with speakers build-in, 1 raw speaker; 3:24 in loop, surround; Dimensions variable; Documentation: Yossi Breger, Ido Biran, Shaxaf Haber. Sand Blinded Eyes was exhibited in it's Hi-fi version with two luxurious Porsche-Boxter, at the International Biennial for Contemporary Music at Tel Aviv Museum of Art. It's Lo-fi version was exhibited at former Barzilay Club and at the Spacehip, Tel Aviv. The musical part of the piece combines parts from Isaiah's revelation (Is, 1, 2-17) and original text by Geffen. The sound physically constructs the visual as an orchestra performing a contemporary vision of an ancient testament of wrath and reproof. The profits voice radiates from the center speaker, the feminine chorus come out from two glossy sculptures in the shape of royal cat-goddesses, and the two matching vehicles boom the harsh beat. The combination between the old testament and cheap attractions and low bases, is a search for new words describing an old curse. they have not been closed, neither bound up, neither mollified with ointment. give ear unto the law of our God, ye people of Gomorrah. To what purpose is the multitude of your sacrifices unto me? and I delight not in the blood of bullocks, or of lambs, or of he goats. When ye come to appear before me, who hath required this at your hand? I cannot away with; it is iniquity, even the solemn meeting. they are a trouble unto me; I am weary to bear them. your hands are full of blood."